Front row left to right: Ronnie Harrell, Bill Fairchild, Jim Cannon, LaVerne Forbes. 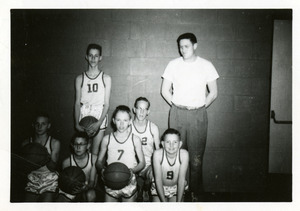 Back row: Larry Haap, Ronnie Aldeman, Norman Six. “Coralville School Basketball Players,” Iowa City Public Library, accessed April 24, 2019, http://history.icpl.org/items/show/1906.